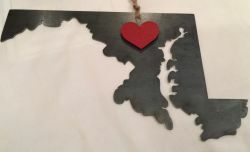 Each Rustic Raw Steel Magnet board includes a winkled red powder coated magnetic heart that can be moved about the board to any desired location. All are boards are roughly 14" at the longest dimension. These are made out of 14 gauge hot-rolled mild steel covered with a thin layer of black oxide (magnetite) which is responsible for its dark gray/bluish tint. While this provides a level of protection against corrosion, a beautiful patina of rust can be brought out by a minimal amount of exposure to humidity. If the rust is unwelcome you may rub grade 3 coarse steel wool over the top to remove any and/or all rust.